Remember Tamagotchis? Of course you do. They taught you about responsibility. They taught you about friendship. And perhaps most importantly, they taught you that friends don't leave friends to die of starvation and despair. But now, it's time to impart that wisdom on a new generation. Rejoice, friends, for the Tamagotchi is back. 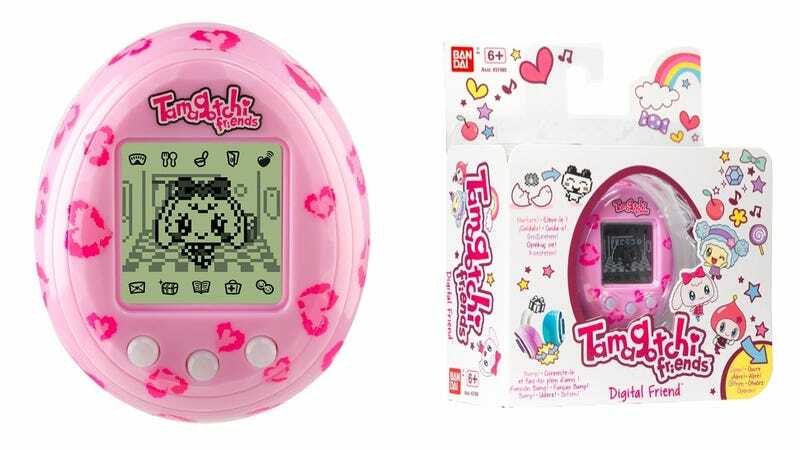 Japanese toymaker Bandai (the same company that gave the world the original) is relaunching the beloved 90s digital pet as Tamagotchi Friends. And though it may look remarkably similar to the needy little pocket friend you once loved so dearly, the Tamagotchi of the 21st century is getting a few key updates to keep the kids these days satisfied. Perhaps the most notable change, though, comes in the fact that you can actually choose one of several different "characters" to raise as your own. This is, of course, in stark contrast to the single, featureless blob we were forced to love once upon a 1996 (RIP dear blob, we hardly knew ye). And considering it's now common practice to exit the womb already clutching a smartphone in each hand, it should come as no surprise that the new Tamagotchi Friends comes fully loaded with "short range communication." This lets you and your (human) friends bump your Tamagotchis together so they can interact and play—you know, like people used to do.